This is Part III of our series on building an integrated marketing plan. You many want to review Part I and Part II where we discuss target audiences. If you\’re following along at work or at home, you should have your target markets as well as some good ideas about your strengths and weaknesses relative to each market. You should also have a list of desired actions for each target audience. The next step in our process is to introduce content into the mix. This is where planning starts to get fun. As with the CARVER analysis for target markets, I\’ll introduce a method for scoring your content ideas based on several factors. Adding these scores to the scores for your target markets will begin to reveal the projects that have the most potential in your overall plan. Ultimately, we\’ll add the channel scores in the final step to see the top overall priorities. There are thousands of ways of grouping and slicing content. I think it\’s important to segment content for better planning and more creativity. 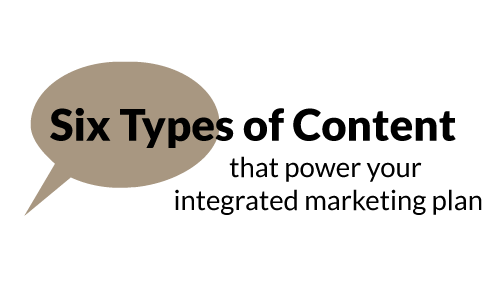 The following chart shows six types of content and the purpose of each. I\’ll talk about each one in detail. This category is where you keep your unique selling proposition, positioning, brand style guide, mission statement, vision, boilerplates and other content you use to reinforce your brand. The goal of this content is to differentiate your company, organization or cause in the marketplace. We\’re huge fans of the Hedgehog Concept introduced by Jim Collins in Good to Great. The basic principle is that a hedgehog does one thing really well — roll up into a tight ball to protect itself from its enemies. What can you be the best in the word at? The intersection of these three questions is where you will find your hedgehog. The target audiences for your brand content is everyone who will interact with your company, including customers, employees and the community at large. Sales support content includes anything that will help sell the service and products that your company offers. It\’s role is to convert people to prospects for your sales pipeline. Think product descriptions, fact sheets, sales presentations and the like. The target audiences are going to be people who buy your products and services. Announcements publicize new products, new executives, company positions on issues, etc. Making announcements help reinforce that your company is moving forward and delivering on the promises made by your brand. It\’s hard to anticipate every announcement as part of your annual planning process. The key is having a list of announcements categories so you can have a plan to react quickly. We\’ll add some more details to this in the next section on channels. The target audiences for announcement are largely going to be your customer base — both prospective and current customers — to let them know your company is growing and delivering more value. This category includes those things that people most associated with content marketing. It is content designed to position your company as an authority in the field and help customers solve key problems. Ultimately, original content helps your organization attract new people who might want to do business with you in the future or support your issue. Your original content is going to have a topic and a form. In our case, I would add \”integrated marketing planning articles\” or \”social media programming presentation.\” Those are just two examples. My content inventory could easily end up with 100 or more pieces when I\’m done. Make sure not to include channel in your content inventory. A single piece of good content could be distributed in multiple ways. We\’ll focus on that in the next post. Curated content is anything that you share from other sources. It connects your company with important topics, online communities and even industry influencers. It is also a great way to be valuable to existing audiences by connecting them to content they may not have seen. I use Feedly to keep track of 30+ blogs and Twitter lists for tweets that I want to retweet or reply to. Investor content is anything that keeps your company\’s investors in the loop. This type of content is often specialized because it contains proprietary information and requires legal review. Often, your goal is to comply with investor regulations or contracts that require regular updates about progress, financials, developments and company news. This category is only for companies that need to communicate with investors. We now have a scored list of target audiences and the broad categories of content that you need to create. It\’s time to build your content inventory, which is a fancy way of saying the big list of content you plan to create. The first step is to build your brand content. This is the foundation and the measuring stick for future content. Make sure to try the hedgehog concepts. Next, I would focus on sales content. Ultimately, every business has to make money, so spend time writing this content. How their support would influence legislators. Craft a series of emails that consumers could send. We started several different emails, including convenience of buying wine where you buy groceries and how laws passed in to 1930s no longer applied in the 21st century. Original content is important for almost every business. This is the content that will attract people to your website and that others will share in social media. Good original content is useful to your target audience, which is some combination of entertainments and education. You\’ll have to play with the ratio depending on your audiences. I\’ve greatly simplified the process in this post. Building your content inventory is an iterative process where you are planning and identifying what will cause your target audiences to take a desired action. At the end of this part of the process, you should have a long list of content that you want to score. One of our goals throughout this series is to give you tools to analyze and prioritize each step in the process — audience, content and channels. Together, these five measures will help you analyze potential content ideas, prioritize them and find strengths and weaknesses. Once again, we\’ll score them on five-point scale with 5 being high and 1 being low. Can we produce this content in-house? Do we have the knowledge to produce this content? Do we have the technology, e.g. video editing or graphic design, to produce this content? Score yourself of 5 if you have everything you need in-house and 1 if you have to outsource it completely. The time to produce content is overlooked. I\’ve been in public relations for more than 20 years. I can bang out a news releases in my sleep. But it\’s going to take me a lot more time to produce a whitepaper or webinar. How long will this content take to produce? Do I need approval of the final product, e.g. legal or compliance? If I don\’t have the capability, how long will it take to identify a vendor and how long will it take them to produce. Score yourself of 5 if the content project will take little time and 1 if it will take a long time (which is, of course, relative to other projects). Because of the multiple scoring elements, long project may end up with a higher total value. Receptiveness is your gut feeling about how the target audience is going to feel about your content. In our Red White and Food campaign, we knew that the general public would be highly receptive but legislators would not. Will there be objections to this content from the target audience? Score yourself of 5 if you think the target audience will be receptive and 1 if not. Make sure to be honest with yourself, especially if you are introducing a new or controversial idea. Content should move people to take some action that is beneficial to your business or cause. It\’s your biggest weapon as a marketer. And, ideally, you want to measure which content is causing the biggest desired action. Some content will be unmeasurable. I really can\’t tell you the exact value of news story because, without sophisticated measurement tools, I don\’t know whether it caused someone to act. Conversely, I can easily measure the impact of an email campaign and sales content on my website if I have measurable calls to action. Can this content include a call to action that I can measure? Do I have to expertise or knowledge to measure this content? Score your content a 5 if you can easily measure the impact and 1 if you cannot measure it. Once again, you\’re going to have necessary content, such as your brand content, that will score pretty low. That\’s okay. The final measure is the cost to produce content. Some content will cost more to produce if you need to outsource the development, hire a designer to make it presentable or purchase artwork. Do I need supporting materials such as video or an infographic? Do I need to hire anyone to help produce this content, including a writer of a designer? Your integrated marketing plan is coming to life. We\’ve now made it through two of the three parts. The remaining step is where we add channels to our mix and complete the cycle.